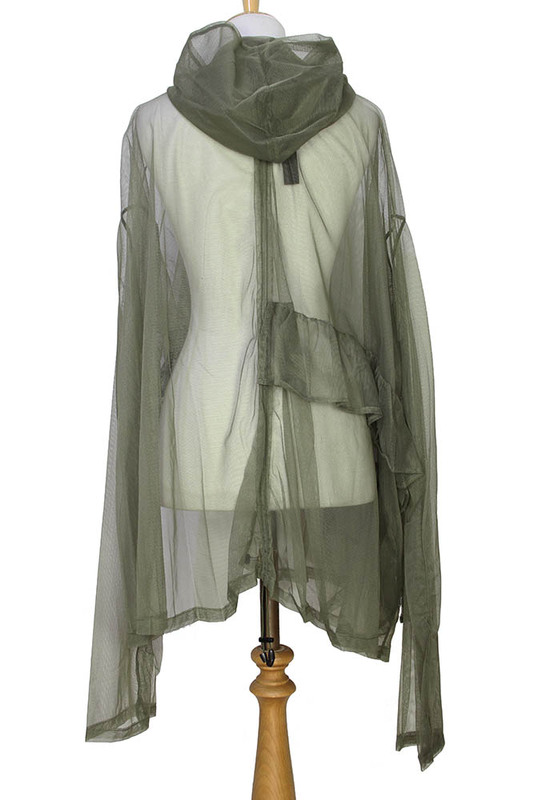 Barbara Bologna one-size, 'T Side Hoodie' in green net fabric, with double layered hood. Zip fastening down front. Very wide, with ver long sleeves and multi frill decoration. Short at front left side waist, which has an elasticated stretch hem. Layered frills on right front extending around to centre rear. On right chest there is an embroidered oval badge with chopping knives and flowers and BE Brave text, pink background and black edging. At centre rear there is a double drawstring with locks so the rear can be ruched upwards.